As every Sun Devil football fan knows, in 2014 ASU secured back-to-back 10-win seasons for the first time since Frank Kush notched double-digit victories from 1970-73. That is a drought of 31 years since it last happened, providing further evidence of how difficult an achievement back-to-back 10-win seasons are to come by. In fact, Head Coach Todd Graham now has a school-record 28 wins in his first three seasons as head coach at ASU, one more than College Football Hall of Fame Coach Dan Devine (1955-57). 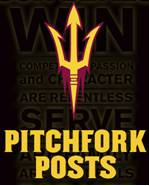 And, the Pitchfork Posts blog has previously stated that Coach Graham has now recorded 10 wins in five of his nine seasons as a head coach (Tulsa 2007, 2008, 2010; ASU 2013, 2014). ASU Athletic Media Relations student intern alumnus Joe Healey got us started and conducted the research. 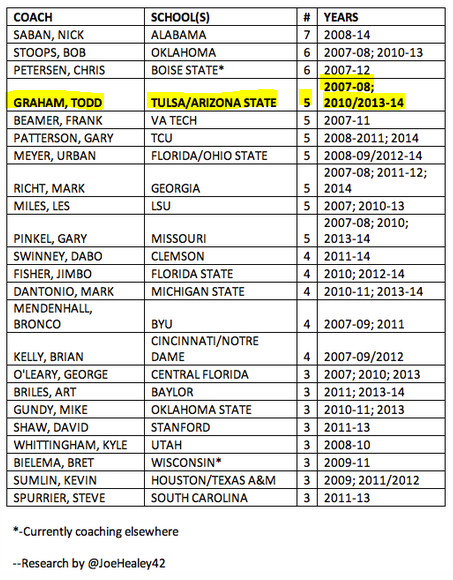 How does Coach Graham’s five seasons of 10-wins stack up in comparison with other active Division I coaches since 2007? Well, quite well, to be sure. Using 2007 as a cutoff and FBS only, Coach Graham currently sits tied for No. 4 nationally in most 10-win seasons with five. • This list only includes active head coaches for 2015. So, what we see is only three active coaches (Nick Saban, Bob Stoops, Chris Petersen) have more 10-win seasons since 2007 than Graham. And, among active coaches, only Graham and Urban Meyer have recorded multiple 10-win seasons at multiple FBS schools since 2007.